NGC6744 is a spectacular southern spiral galaxy which lies about 35 million light years away in the constellation Pavo. This galaxy has a magnitude of 9.4 and size of 23' x 14'. It is considered to be one of the galaxies most like our own Milky Way Galaxy in our immediate vicinity, and has similarities in terms of chemical compostion as well as it morphology. This image shows only the core region (about 8 arc minutes per side). 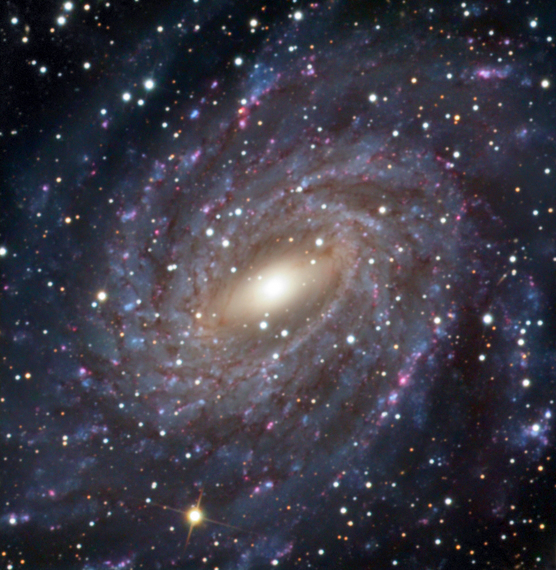 At the 3 o'clock postion a small edge on galaxy is seen superimposed on the spiral arm. Used with permission, No reproduction of these images are permitted without written approval from Gilbert.